Printed at the Government Print Works, Paris. † Scott numbers all the black handstamps first (Sc1-13) then one red (Sc14) and two blue (Sc15, 15A) handstamps. Gibbons lists the blues and red as SG4a, SG6a and SG6b respectively. 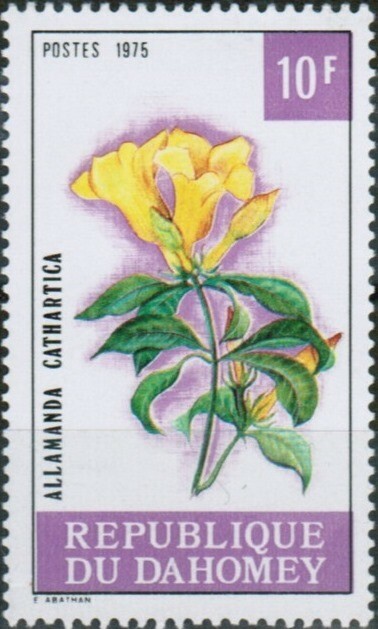 Thus both catalogues list 16 stamps in the first set. 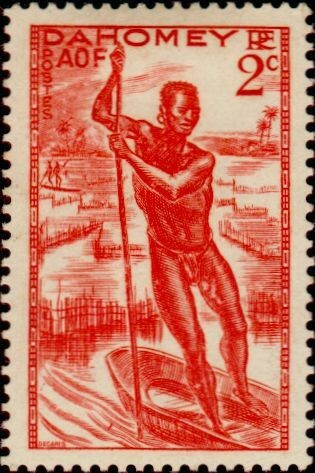 The King of Porto-Novo sought French protection in 1863 and again in 1882, leading to the issue of stamps for the Establishments of Benin in 1893. King Behanzin of Dahomey was in dispute with the French over slave-trading and, following his defeat, France annexed the region and consolidated it into Dahomey and Dependencies. This continued as a French Colony until WW2, including some issues from the Vichy govt. 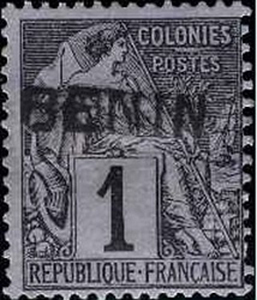 After the war, the stamps of French West Africa were used until independence. 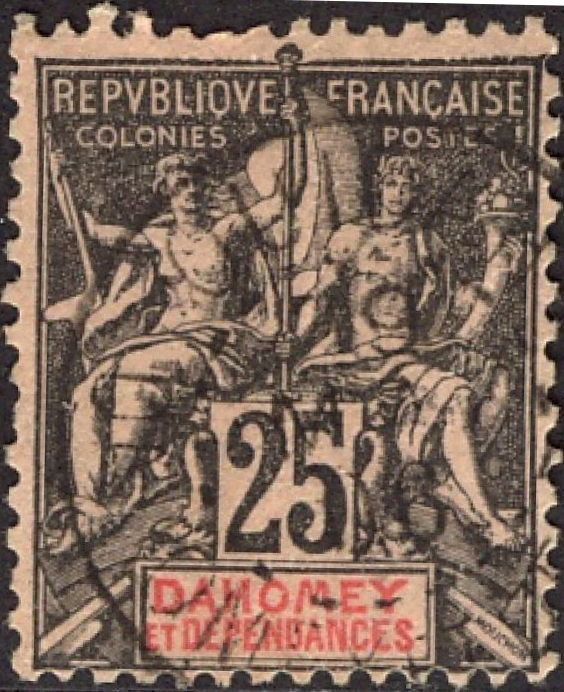 § The first two sets for the People's Republic of Benin are inscribed "Republic of Dahomey". Gibbons states that it was intended to overprint them with the new name, but this was prevented by technical difficulties. The first stamp inscribed for the PRD is also shown below. Δ For Dahomey and Dependencies, the 1 centime black / azure Sc1 SG1 was issued in 1901: the first stamp of the set to be issued was the Sc8 SG8. 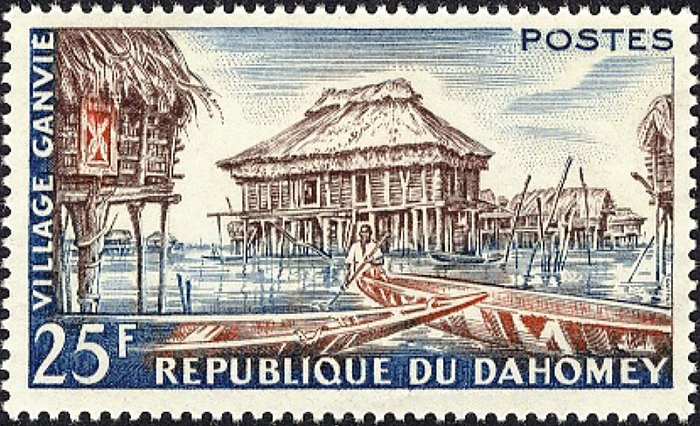 Dahomey became an autonomous republic within the French community on 4th December 1958 and an independent republic on 1st August 1960. 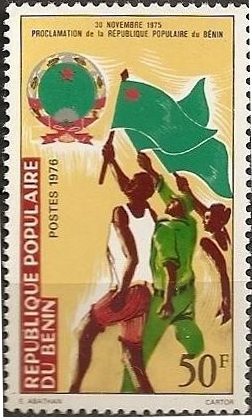 On 30th November 1975, the name was changed to the People's Republic of Benin.